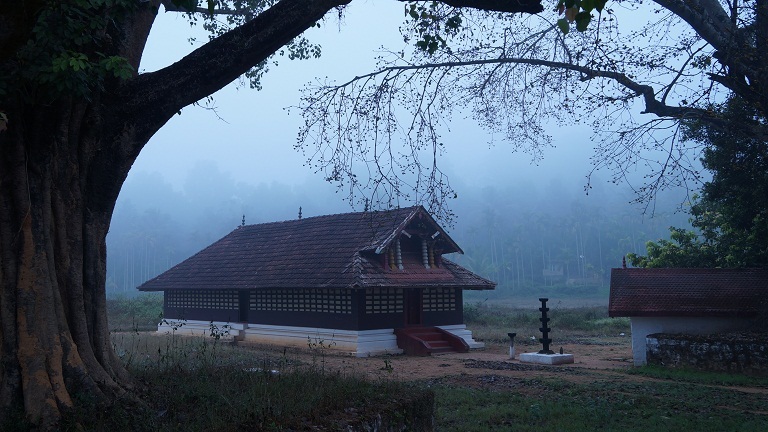 The Valliyoorkkavu temple, located high in the Wayanad hills at Valliyoorkkavu, 3 km from Mananthavady town is dedicated to Goddess Bhagavathy. Here goddess is worshipped in three of her principal forms - Vana Durga, Bhadrakali and Jala Durga. The annual 14 day arattu festival of this temple whose idol is believed to have been self-manifested is held in the month of March. Announcing the festival, the sword of Valliyooramma will be brought from the Palliyara Bhagavathy temple at Pandikkadavu near Mananthavady by the chief priest on the first day. Unlike other temple festivals, here the kodiyettu (the flag hoisting ceremony) is performed only on the seventh day of the festival by tribal chieftains. Important rituals held during the festival include the oppana varavu, a procession from Cheramkode Bhagavathy temple at Kallody near Mananthavady will come to Valliyoorkavu temple. Adiyaras, a procession with tender coconut for abhishekam (ablution) marks the arattu of Valliyooramma. The festival concluded when the oppana varavu returns to Cheramkode Bhagavathy temple after the rudhirakkolam, a symbolic fight between Goddess and the demon king, Darika, in which the Bhagavathy wins. The traditional ritual arts like Kalamezhuthum pattum, Eedum koorum (special dance performed by orcales) and Sopananritham will be performed during all the nights of the festival. The dances performed by the local tribals using native percussion instruments are another highlight of this festival.